The Army has just selected Oshkosh to build the Joint Light Tactical Vehicle (JLTV), but a huge fight is brewing amongst the losers. The Army has just awarded a massive new contract to Oshkosh to replace its entire Humvee fleet with the Joint Light Tactical Vehicle — but a huge fight is about to erupt. This is a huge contract that could be worth up to $30 billion, so the win for Oshkosh was massive — and it represented an equally massive loss for defense industry titans like Lockheed Martin and AM General, so they may not be willing to go down without a fight, according to a Defense News report. It’s the largest acquisition program from the Army in a long time, and protest appears to be inevitable. Even if the losers aren’t successful in reversing the decision, it will have major repercussions for the program, delaying it by at least 100 days as the program is examined. This is an important delay as it comes just as the program is starting to get moving. 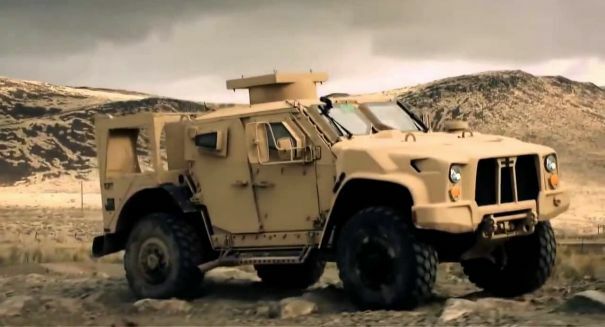 The JLTV program would involve building 49,100 vehicles for the Army and 5,500 for the Marine Corps. Meanwhile, the future of the Humvee — built by AM General — is uncertain. It became an iconic vehicle in the ground wars in Iraq and Afghanistan, and there are still 13,000 Humvees in operation with the Marine Corps and 120,000 with the Army. It’s not quite certain how many of these will be replaced and how they will be used down the road. Lockheed and AM General haven’t officially announced plans to protest, but they are definitely considering it as a possibility. AN official with the JLTV program for the Army said he doesn’t expect a protest. Oshkosh, however, said it would not be surprised if a protest was filed simply because it was such a high-stakes contract. Filed Under: Business, Front Page, Top Story, U.S.